INSECT-FREE: A GUIDE TO HOME VEGETABLE INSPECTION in which viewers are guided expertly in the fine art of ensuring that their vegetables are kosher. WHAT'S WRONG WITH THIS CHICKEN A practical guide to identifying the kashrus red-flags related to raw chicken. To purchase the NEW What's Wrong with this Chicken DVD at $10 or the entire set at $40, or to request an "OU Kosher Coming" program for your school, synagogue or community - contact Safrane@ou.org. OU Kosher - Live & in Person!! 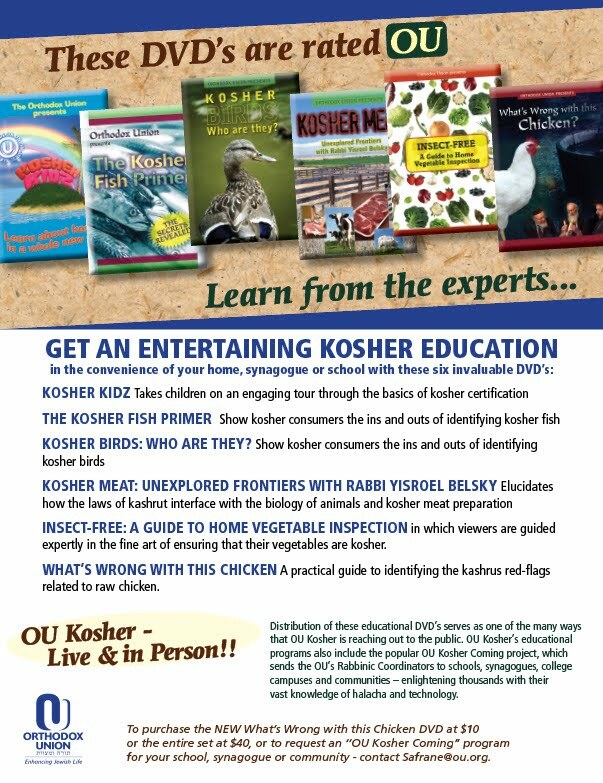 Distribution of these educational DVD's serves as one of the many ways that OU Kosher is reaching Out to the public. OU Kosher's educational programs also include the popular OU Kosher Coming project, which sends the OU's Rabbinic Coordinators to schools, synagogues, college campuses and communirties -- enlightening thousands With their vast knowledge of halacha and technology.